Moriarty's Grand Niece & Nephew! What? 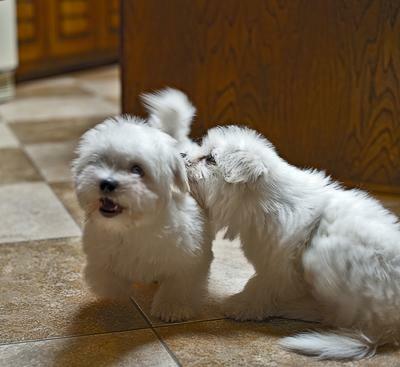 I was NOT wrestling with my Brother! Kiss! I love my Brother! Mmmm, Nom, Nom, Toes, Nom, Nom! So, last weekend I went and visited Moriarty's breeder, since I never got to meet her when I got Moriarty and I thought it would be nice to meet her, let her see how Moriarty had turned out and talk to her some about Moriarty's family history. First off, it was a blast. She is one of the nicest people I have ever met and so is her husband. The next park was that Moriarty's father, Rocky, was a several time US National Champion! How awesome is that! His mother Dora was also a champion! Needless to say Moriarty has some nice relatives. The other exciting thing was that she had puppies! Two sets and the older ones, at 9 months, were Moriarty's Grans Niece and Nephew! They looked just like his when he was their ages! She also had another set of puppies, from a different mother, not related to Morty, but they were very young so we just tickled their noses but didn't get them out of their kennel. Anyway, here are a couple of pictures of Moriarty's Grand Niece and Nephew and they are adorable! If I would of had the money I would of gotten one, so cute (but they were all spoken for)! Comments for Moriarty's Grand Niece & Nephew! What an opportunity u now have w/a breeder so close that u have connected with. Wonderful pictures I am jealous. Good luck in ur new adventure. thanks for sharing the photos...could Moriarty's relatives be any more adorable? What a great lineage. Have to agree that Coton's are really a special breed. Yeah, same here. When we bought Cotton the breeder made us agree to spaying also. She had flesh colored spot on nose and was not deemed perfect enough for the show ring---or that is what we were told. since then I am hearing alot of breeders demand that. Perhaps that is a way of keeping down the number of cotons and being sure the blood line stays good...in which case that is a good thing. Sounds like you have a great place to raise pups and we wish you luck in doing so. I can sure agree that they are the bright spot in our lives. We always have had dogs and they were always loved but these little cotons are so loveable and almost human. Best money ever spent. Will have to check out Moriarty's fb page and see what all he is up to. No, Moriarty will not be having puppies. Part of the contract was that the puppies had to be neutered / spayed. So I had Moriarty done when he came of age. I am considering it in the future. I have the perfect house for it now. Large backyard, an entire room I can use to keep the puppies corralled, you know how they can be! I was going to talk with her and see what she thought about it. I have raised a couple of litters of Golden Retrievers, which is also an awesome breed and that was rewarding. She would be the perfect mentor and she's close, about a 2 hour drive. She's been breeding them for over 20 years, so I couldn't ask for a better mentor and she has connections with other ethical and pure Coton bloodlines, plus all the dogs are genetically tested and those records are done for both sides. I was lucky to find her. I think it was God's way of helping me find an Angel, because Moriarty really is one of my brightest spots in life. Without the little guy it would not be even close to what it is. Plus I love the breed. How wonderful you got to take the trip and let them see how moriarty looks and is cared for...The puppies are just adorable, almost makes me want another one also but two is enough. He sure comes from some winning bloodlines, are you breeding him? These dogs are beginning to get alot of attention, they are so special. Enjoy him. 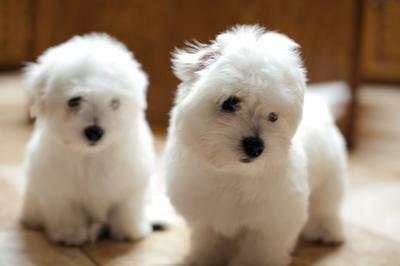 I love the white pups. Our Bentley is black and white.